I’ve been helping out at the library once or twice a week with shelving, mending, and with setting up book displays. My full-time colleagues handle the queries and all the other administrative tasks. I enjoy my time there immensely because it is quiet (usually) and I get first (or second) dibs on new books and magazines. The typical users in my library look for their books on computers. They can check if the books are available, and an automatic layout pops up with the locations. They borrow their books by scanning their Library IDs and then the books, and out comes a little date-due slip. The same computers tell them where to locate reference books and resources meant for in-library reading. If there is a fine to be paid, it is deducted from a cashcard. 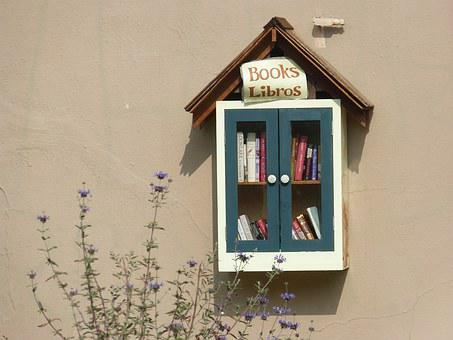 Librarians not required. My colleagues find themselves excelling these days in two major areas: on search and rescue missions when the computer says a book is right there but nobody knows where it really is, and by listening when visitors come in more for a chat than a book. Because, yes, we do have visitors who stop by mid-morning and stay past teatime as the library represents their only human contact for the day. As the march of technology continues with ebooks and elibraries, and as funds are diverted to apparently more useful purposes than maintaining a building for reading, the community library and its librarians may be endangered. I find that sad. Now, I realise not all libraries are the same, nor are their visitors. My experiences may simply be the result of my particular community. But I suspect there might be some similarities wherever you are. So what has this rambling piece got to do with kindness? I want to say “thank you” to the three teenagers who asked if we needed help with putting up posters. To the lady who asked if we wanted coffee on her way to get some. To the two little girls who said, “thank you, and see you in two weeks!” as they left. To the visitors who wave, smile and plain old recognise there is a human being sitting behind the counter. And to you, the librarian: thank you for doing what you do in promoting reading, in caring for reading material, in maintaining a safe environment for reading whether it is in a school or community hall, for being the forgotten guardian of what we want to know. I’m pretty sure folks know by now that leaders Donald Trump and Kim Jong-Un will be meeting on 12 June in Singapore. As I write this, it is in the early hours of 11 June. Both leaders have apparently arrived in the city state but have yet to meet. But here they are on an artist’s easel! I chanced upon this talented gentleman in a mall, and he was kind enough to allow me to photograph him and his work. Thank you! I went to the pharmacy yesterday to pick up my prescription, tablets which cost $8 a box. As I was allowed to buy a maximum of 5 boxes, I did just that. I queued, paid with my credit card, took the boxes and left. And, no, silly me did not check the charge slip, which explains the mayhem that ensued. You see, my credit card requires a signature for purchases above $10. The fact that I hadn’t been asked to sign anything for a $40 purchase only hit me as I was halfway down the escalator to leave the building. Upon checking the receipt, I found that I had been charged – you guessed it – $8 for all five boxes. Dilemma! Go out the door (the car was right there!) and no one would be any wiser. Or go back up and pay the full price. I will be honest to say it was so tempting to head right out – I would have saved $32 and, I mean, who would have known? At which point the manager sauntered over. I retold my story. By this time there were three people behind me in the queue, all listening with great interest. Hmm … that didn’t sound exactly right. Took? Eventually, the manager got it. The cashier got it. The cashier also got it from the manager but that’s another story. I paid the full amount and left. I will always cherish the support these total strangers offered. But I think I’ll go to some other pharmacy next time. And check my receipts before walking off. Who knew it would take this much effort to right something? My colleague, Sandy Mohan, was sent to collect some documents and resource packs from an associate from another division. Sandy called the office ten minutes after the designated time to say Christine Li had yet to arrive. Had there been a message to the office? What should she do? We checked with Christine’s office, only to be told she had called to say she couldn’t find Sandy at the location. Was there a mistake in the venue? Or time or day? Or something? Two perfectly professional women making the same error? Not likely. The mystery was solved when Sandy returned to the office and told her story in fits of giggles. Turns out that Sandy – who is Korean and married to an Indian – was looking out for a Chinese woman. Christine – who is Indian and married to a Chinese – was looking out for an Indian woman. Both women were using their married surnames, and they had been standing almost side by side the entire time, never realising who the other was. Even in a multicultural and multiracial environment where I work, this incident continues to cause hilarity. Sandy and Christine have become close friends. And I’m thankful we can all laugh along and celebrate our diversity. Like the young Kung Fu Panda, I was a bumbling rookie, trying to find my way in an organisation filled with folks who already knew what to do and how to do it. There was no use for a rookie. And then I met the unfortunate Shifu, who was assigned to be my mentor. He must have had plenty to say, not that I heard any of it. He simply had me shadow him to every conference, meeting, discussion group … you name it, I attended it. Everything I wrote, he checked. Everything I had to present, he checked. Some might say he micromanaged or was bossy or had some sort of negative intention. All I felt was grateful for a Department Head who bothered to explain things, from how to use the inhouse templates to how not to irritate the clerk so she wouldn’t put your folder at the bottom. He critiqued and found fault. He approved and gave credit. He squabbled over points and lost his temper. He went to bat for something I believed in. We figured out how to work together. Seven years later, the unimaginable happened. I was promoted to – in a situation of epic tragi-comic proportions – a position that included being Shifu’s supervisor. And this is where his true colours shone. We had a talk about how to manage this: he saw no reason for either of us to transfer, and assured me he had no issues with me bossing him. Well, I had plenty of issues with that! How was I supposed to tell Shifu what to do? What if I totally disagreed with a decision he’d made? How was I supposed to do his appraisal report, which was inevitable? This was horrible! I did not train you to be me. I trained you and guided you so that you would be better than me one day. Now get out there, be professional, be objective, be you and do your job. Today, Shifu is happily retired. We met for lunch two months ago, and will be meeting again soon. Exactly six months ago, I received a call no parent ever wants to get. The Munchkin, on the other side of the world, had developed an eye infection that was diagnosed as conjunctivitis. The Doctor’s eye drops and anitibiotics did nothing to help. In the photo she sent, she looked like the ultimate loser in an MMA punchup. The Munchkin recalls sticking her face into the Nurse’s, and demanding to know under what circumstances then would she be entitled to a session with a doctor? When blood leaked from her eye? Apparently, the Nurse finally took a good look at her and panicked, sending her straight in to the Doctor ahead of everybody else in the waiting room. The Munchkin was then taken to Sunderland Royal Hospital, where an eye surgeon and his team were already waiting when she arrived. She was allowed to make that dreaded call, then was whisked off to get the infected fluid in her sinus cavity drained. The “conjunctivitis” turned out to be infected fluid building up under the eyeball and in her upper eyelid. And yes, it was that bad. I was on the next available flight. 22 hours later, I was at the hospital and meeting with her surgeon and nurses. It was well past visiting hours but the surgeon had arranged for me to visit, and to stay as long as I wanted. The nurses offered hot tea and dinner, if I didn’t mind leftover beef pie. And then someone found a small tub of ice-cream. Which is the point of this post. I can’t remember the names of every nurse who cared for The Munchkin. But if any of them reads this, or if anyone reading this knows a nurse or the surgeon at the Sunderland Royal Hospital who cared for a young girl with a swollen face (admitted 27 October 2017), please tell them I remain deeply grateful and thankful for their professionalism and care. I could never thank them enough for the level of reassurance, kindness and comfort they provided. Thank you, Sunderland Royal Hospital and Sunderland Eye Infirmary.